The brothers Oscar and F.E. Ruffini were both prominent in Texas architecture during the later part of the nineteenth century. Born in Cleveland, Ohio of immigrant parents, they received their architectural training in firms in Ohio and Indiana. In 1876, F.E. Ruffini opened an office in Austin, where two years later he was joined by his brother. Before becoming established in Austin, Oscar Ruffini worked for a time for the firm of E.E. Myers of Detroit, Michigan–the E.E. Myers architects are known for the Texas State Capitol. In 1884, Oscar moved to San Angelo. Apart from work such as F.E. Ruffini’s design for the Old Main Building for the University of Texas, the brothers were known chiefly as designers of courthouses. By the mid- 1880s they had developed a full blown architectural vocabulary for the building type. Oscar Ruffini’s Sutton County Courthouse (1891), and F.E. 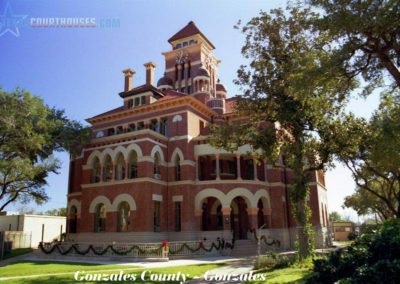 Ruffini’s Blanco County Courthouse (1885) exemplify the style which appeared in a somewhat more decoratively evolved form in the Concho County Courthouse (1885). While a high central tower was usual on many nineteenth-century courthouses, the Ruffini’s developed the Mansard Roof of the Second Empire Style as the dominant visual element in a composition lacking a tower. Also, in contrast to the complicated massing of recessed bays and projecting pavilions usually encountered, the Ruffini’s substituted a simpler geometry of superimposed elements in the facade. The Sutton County Courthouse, a small two-story structure of a cream-colored native stone, was built on the traditional patterns with intersectiny corridors running through the center of the building. As was typical the courtroom was in the center of the second floor. Visually, the unadorned Mansard roof with pavilions at each of the entries is a dominant element of the composition. Each elevation is broken up into receding masses, defined by cut stone quoins at the corners in contrast with the rough ashlar of the wall. The masonry is further enhanced by smooth finished segmental arches spanning the windows and by string courses between floors and at the springing point of the window arches. An elaborately bracketed cornice tops the walls. The entrance pavilions are marked by a triangular pediment above the cornice and by an arched entry flanked by carved pilasters. The exterior retains most of its original appearance and it is the only courthouse ever built in Sutton County. Due to its association with a prominent West Texas architect and its style, the temple possesses considerable regional significance. Ruffini left his imprint on many Texas communities and the building is an excellent example of the Second Empire style. A beautifully detailed work, it is one of the finest examples of nineteenth-century architecture to be found on the Edward’s Plateau. Sutton County was created from Crockett County in 1887 and was named for John W. Sutton. It was organized in 1890, with Sonora as the county seat. 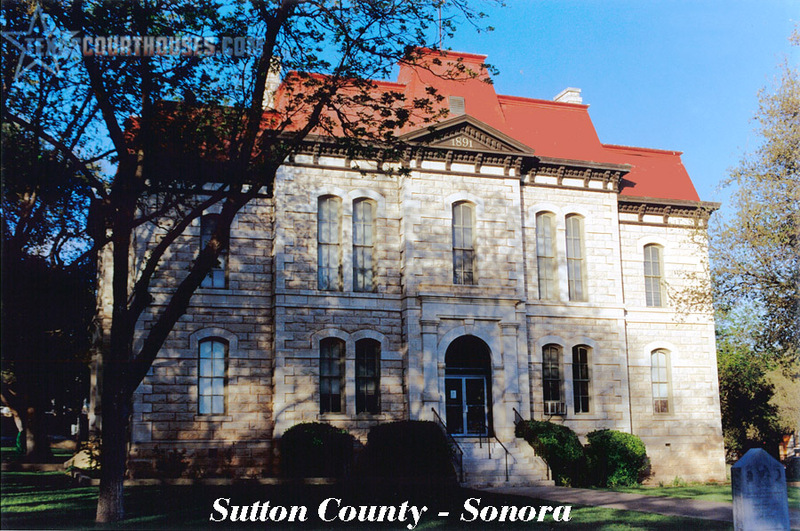 On February 11, 1891, the Commissioners Court met to order that San Angelo architect Oscar Ruffini “prepare all necessary general and detailed drawings and specifications” for the construction of Sutton County’s first Courthouse. The court further moved that “the said Ruffini be requested to superintend construction. . .” For these services he was to receive a fee of 3.5% of the contract price of the building. On March 31, 1891, J.D. 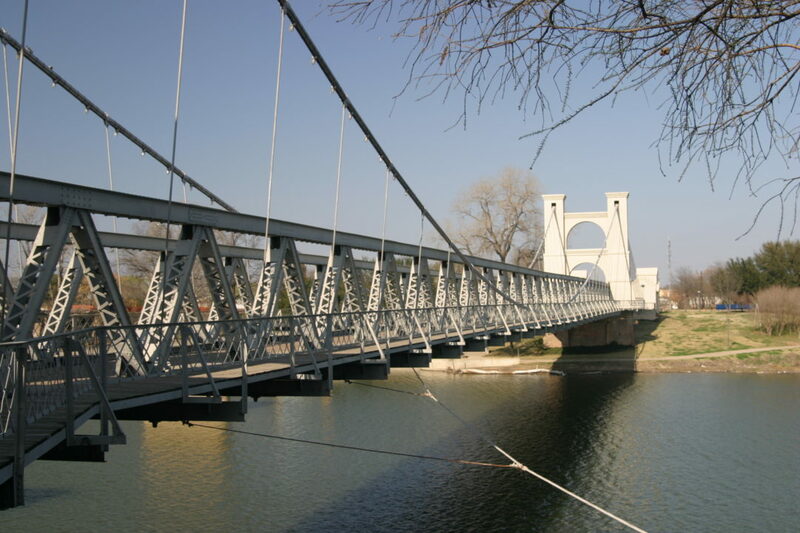 Gafford submitted low bid of $27,706 and was awarded the contract for construction. That same day the Commissioners’ Court moved that “the plot of around known as Courthouse Square, same being 300 feet square, except amount reserved for well and water purposes be accepted.” Several citizens donated the land and the court promptly appointed an attorney to accept the deed. The court received the building on July 5, 1893. Today the courthouse continues to serve its original function.